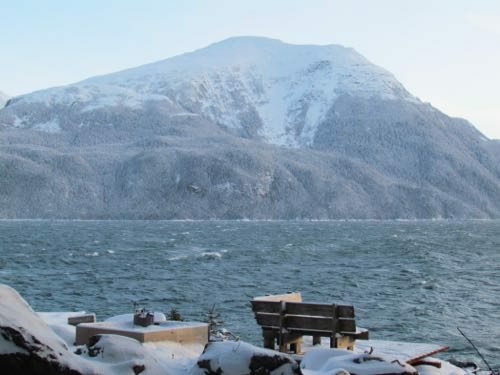 The Zeiger Family Homestead Blog » Shop Early to Beat the Alaskan Winter! Shop Early to Beat the Alaskan Winter! We just came through a snowy period that has slowed mail in and out of Haines. That, of course, has me worried, as it’s Christmastime. Not only do we anticipate mail coming in, we want mail to get out in a timely manner. Specifically, I want to expedite holiday shoppers who place orders from us! Delivery doesn’t pose much of a problem for some items for sale on our Store page. 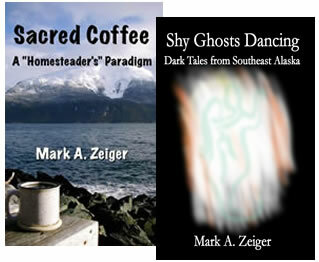 Sifter plans, eBooks of Sacred Coffee: A Homesteader’s Paradigm and Shy Ghosts Dancing: Dark Tales from Southeast Alaska are delivered electronically—no flying weather required! The same goes for the digital download of the audiobook version of Sacred Coffee (more on which below). At least the planes will fly in this, if the wind doesn’t rise too much (Photo: Mark A. Zeiger). T-shirts, mugs, and other goodies (Christmas ornaments?!) with our original designs ship from Cafepress somewhere outside, where Alaska’s winter weather can’t slow them down (unless, of course, you’re ordering from Alaska . . .). However, if you want soap (see Finally: Our Full Offering of Soap) or autographed hard copies of Sacred Coffee or Shy Ghosts Dancing, ordering sooner rather than later would be advantageous. As for the Sacred Coffee Audiobook, we just reduced the prices! The MP3 audio CD edition (best for gifting!) is now $5.00 less—$14.99 +$3.00 S&H, the same price as the print edition. The Digital Download edition used to be $14.99, it’s now $9.99. Both books in all mediums, unautographed, may be either found at or ordered from your local independent bookstore, as well as Amazon.com, Barnes & Noble, and other online book sellers. Again, these sources free you from the uncertainties of small town Alaska flight service and weather. Most time consuming of all, requiring immediate ordering if you have any hope of gifting for Christmas, are Aly’s custom-made knit items! Her job at the museum in town keeps her busy, but she does find opportunities to knit. Order now if interested! I have to say here, Haines has one of the best, most dedicated Post Office staffs in the country! They and their flight and freight partners do an amazing job of processing the volume of mail that flows in and out of town. But, even they can’t control the weather. Even so, they’ve got methods I don’t even know about, and they work much harder at getting packages to customers and loved ones from Haines than any commercial shipping company does. Order early, but order with confidence—your shipments will likely arrive in plenty of time for Christmas. If not, I call upon my parents’ assurance from when we were kids: “Living in Alaska [to which I’d add “ordering from Alaska”] makes the Christmas Season last even longer!